Join Our Core Community Now! Up-to-the-minute text and email updates with professional astrology tips on how to make the most of each moment. Weekly astrology readings by Eric Francis designed to support, inspire and inform you. Weekly articles to keep you connected to the rapidly changing world around you and to understand how it is impacting you. Extended monthly readings from Eric to help you plan better and anticipate possible challenges in the month ahead. Access to the stellar work of our writing team covering important topics such as astrology, tarot, relationships, current events and more. Access to the Oracle, a fully searchable database with more than 10,000 horoscopes, plus a handy divination tool. In-depth birthday/ascendant audio readings. This is almost like getting a personal consultation with Eric for yourself and any loved ones whose astrology you track. Each reading includes a fresh perspective on current transits and how they extend into the future, along with a special tarot reading for that sign. A discount on the 2016 annual edition, which will contain written and audio readings for all 12 signs. This book-length online publication always meets rave reviews by readers who refer to it throughout the year for its long-range, big-picture guidance. Access to our best-selling Spring and Midyear Reports. Past reports have covered relationships, making money doing the work you love and how to handle Mercury retrogrades; 2016 is sure to include exciting offerings. Research/lookup service for astrology students. We will assist you in researching any articles you need for your astrological studies for as long as you are subscribed at this level. Discounts on special projects, including the GENERATIONS series of readings and Eric's well-received astrology classes. These prices hold for the first 111 buyers only! After this the price will increase. "The smartest astrology I've ever read!" "Planet Waves is one of the things that keeps me sane in an insane world." "Nowhere else can I get this kind of information." 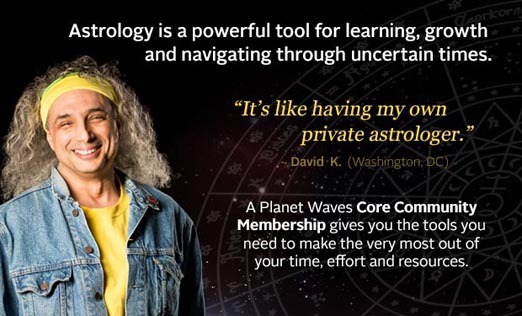 "Planet Waves has inspired me to become the catalyst in my own life." "It's like reading with your glasses on. Everything becomes clear."